Melbournians, it’s time to don those yoga pants. No, it’s not time for a Netflix marathon with a bottle of wine – we’ve found something even better. And you’ll actually be working out! Flow Athletic is hosting a silent yoga disco, and people are bending over backwards to attend! Held at the Melbourne City Town Hall, the event will involve 90 minutes of all-level Vinyasa Yoga led by Flow Athletic co-founder, Kate Kendall. Participants will don wireless headphones, which relay Kate’s guidance as well as the chill beats of Sydney DJ, James Mack. This unique experience is like a one-on-one private lesson, but far less intimidating. And because the headphones block out a lot of distracting outside noise and allow you to really focus on your yoga practice, you’ll want to Namaste quite a while. Whether you’re a practised pro, or your Downward-Facing Dog is still a bit ruff, we can guarantee that yoga-nna love it! 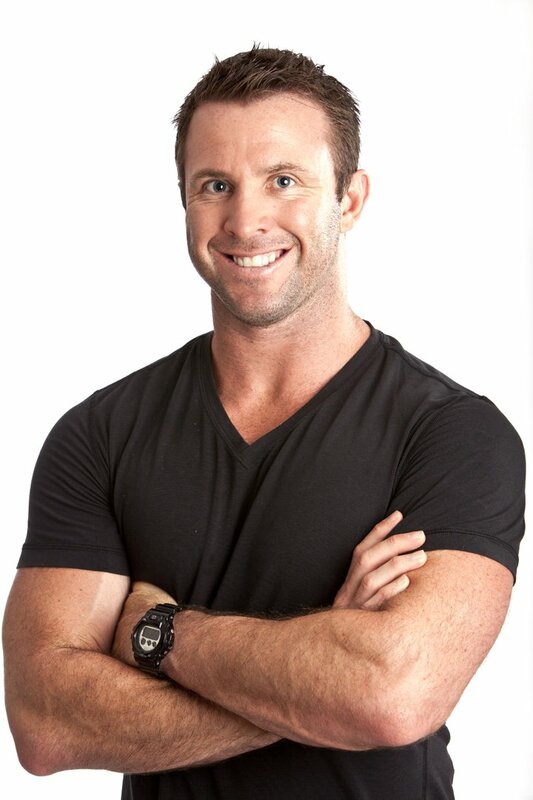 We had a chat to Flow Athletic’s owner Ben Lucas to find out what we can expect. Hi Ben, can you tell us where inspiration to do a silent yoga disco came from? I travel to the US twice a year to see what’s trending over there and on one of my last trips I heard about Silent Yoga Discos. While I didn’t actually get to see it in action, I decided to look into it and I found a company in Australia called Silent Sounds who hire out the glowing headphones. We tested the concept with our clients who were involved in our 30 Days Clean program in February and it was a huge hit so we decided to put on another Sydney event (in April) for 350 people. That event sold out in three days and we had such a massive waiting list that we have decided to do more events in Melbourne and Sydney in June and July. I started practising yoga because I was participating in up to five ultra endurance events per year at the time and I didn’t want to get injured. I stumbled across the incredible Kate Kendall and I found that in her classes no only kept me injury free, but my performance also improved with my increased flexibility. I have been a yoga devotee ever since. I try to do two yoga classes per week and at least one is a yin session to help me wind down. Kate became the co-founder of Flow Athletic and she is our incredible Yoga Director. Silent discos and pop-ups have become very popular lately. Why do you think people love participating in these sorts of events? I think they are fun because they are a one-off. It’s not something you can get anywhere, and furthermore even if you could it’s unlikely that you would get a crowd of 300-500 people in the one class if you were to do it on a regular basis. All of our events have had a great energy. People have looked forward to them and when they arrive we always try to have added value for them. IsoWhey Wholefoods has been providing superfood snacks for our guests, Stylerunner has a presence, and at our Sydney events AVEDA set up a mini hair salon to do braids for those who want them. It’s a great healthy activity to do on a ‘school night’. Furthermore, while you are participating in the class, as you have the noise cancelling headphones on they stop you from becoming distracted. It’s quite a surreal feeling to be doing a class surrounded by hundreds of people yet feeling like you are completely alone. 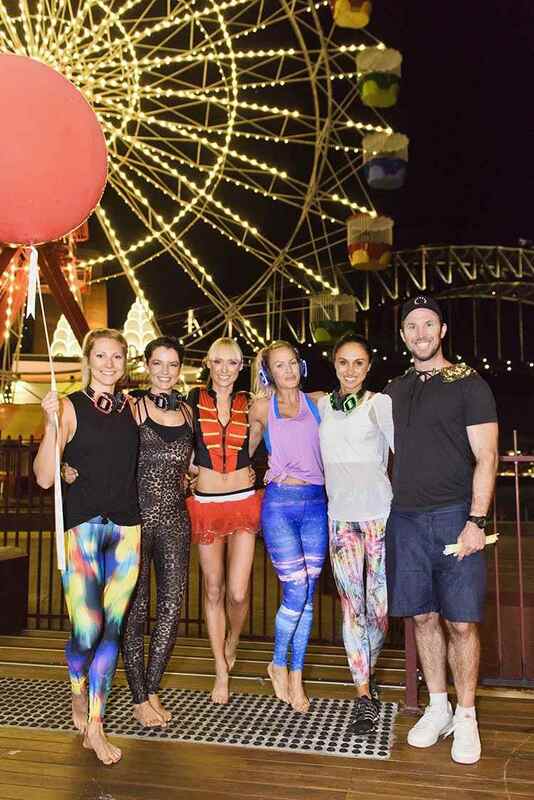 Why was Vinyasa chosen as the style of yoga for Flow After Dark? Vinyasa is a great class for people who to feel like they have done a workout. It is also brilliant for people who are not as familiar with yoga and as our event attracts all types of people, we didn’t want to scare them off with a style that requires more concentration or meditation. Plus it feels nice to flow through the moves and as there is a lot of energy in the room and we want to keep that energy level up. We hear that DJ James Mack will be putting together the mix – what sort of music can we expect? The music that James plays for these events are usually popular songs, but they are often versions that are relaxing and calming to listen to. After the yoga sessions, there will be snacks from IsoWhey Wholefoods and Pressed Juices. What do you love about partnering with these brands? We believe in having a holistic approach to health and that means everything, from having a balanced fitness routine (at Flow we believe that each week you should be doing cardio, strength and yoga to keep balance) to eating well and having a good diet. IsoWhey Wholefoods use great quality ingredients and their range is very superfood rich making them the perfect pre or post snack for a yogi while pressed juices ensure that maximum nutrients are in each juice due to the way they press the ingredients. Aside from yoga, what are some ways you like to wind down at the end of a busy day? I like to hang out with my wife Talitha and my dog Wilbur and I also meditate. 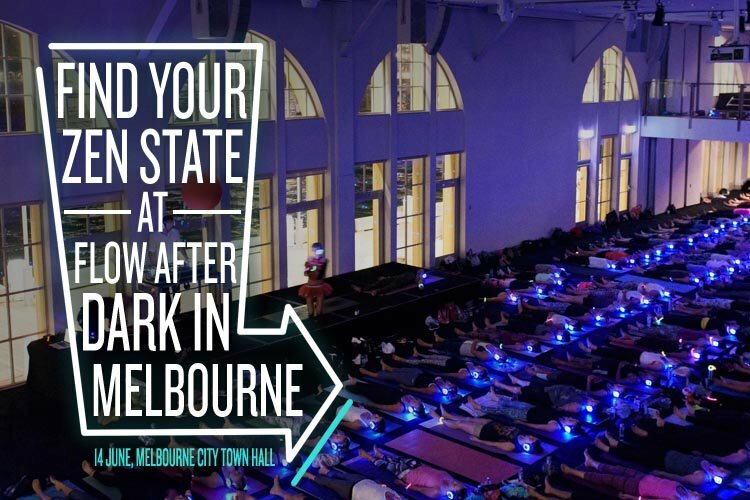 Flow After Dark will be taking place on Tuesday, 14 June at the Melbourne City Town Hall. You can buy tickets from Eventbrite – be sure to grab them before they sell out!